Are you tired and frustrated of being denied credit? Are high interest rates robbing you of your hard earned income and preventing you from getting out of debt? Your low credit score may even be stopping you from getting a new job or home? Take heart. There is hope because, for the first time ever, Hidden Credit Repair Secrets exposes the heavily guarded credit repair secrets used by certified credit consultants and credit repair law firms. One of their own has actually begun to make these strategies and techniques available to the public. 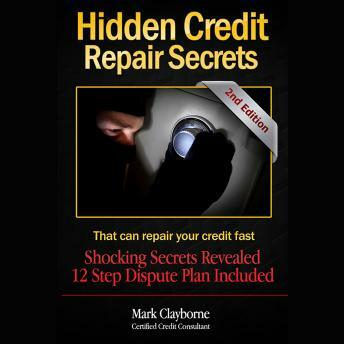 As a Certified Credit Consultant with years of experience in the credit restoration field, Mark Clayborne divulges how to legally restore your credit in his ground-breaking book, Hidden Credit Repair Secrets. * Legally restore your credit report. * Remove damaging negative marks. * Settle your debts for pennies on the dollar. * Stop collection agencies from harassing you. * Establish and rebuild your credit. * Bounce back from bankruptcy within a year. * Raise your credit score fast. As a special bonus, Mark Clayborne has included a 12-step dispute plan that will allow you to send carefully-crafted dispute letters with the appropriate language to get negative items removed from your credit report. All letters were reviewed by attorneys. No thinking or studying is required. Just input your information and send the letters. Bad credit can be limiting and even disastrous to your quality of life, begin restoring your credit and financial health today. Everything you need is included in this one book, Hidden Credit Repair Secrets. I found this book to be very informative, especially if you are a novice, not so much for the well experienced but still a great deal of valuable information.